See Vilnius in a day! 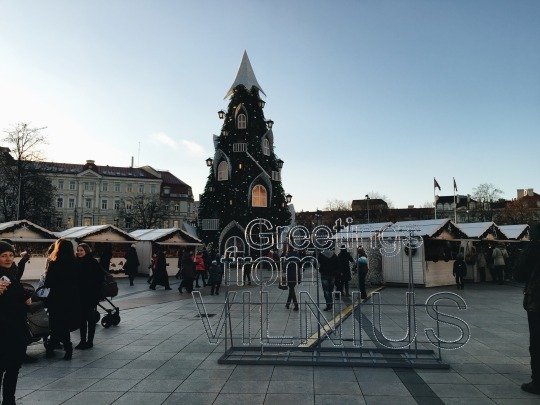 So on our first night in Riga, Latvia – we decided to go on a day trip to Vilnius, not only has it only had independence for 25 years, it is also the geographic centre of Europe – so it was a must. I find Eastern European culture fascinating due to how different it is compared to anywhere else in Europe and the feel of going back in time – so seeing as much of it as possible whilst I can would be perfect. Lithuania is the 4th country I have visited in this area of Europe. 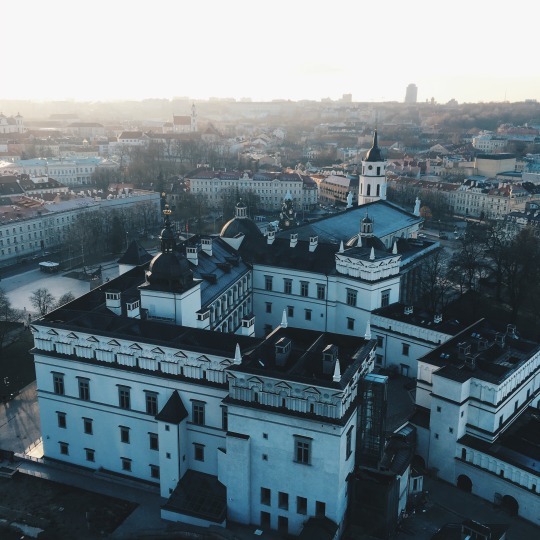 It’s crazy how one part of Vilnius appeared to be run down and derelict looking, with the other half filled with tourists immersing themselves with in history that Vilnius holds. We arrived in Vilnius at 11:30 and were due to leave at 18:00. So we were in this new country for just over 6 hours but wanted to make the most of it. Upon arrival, we headed to one of the hundreds of coffee shops. Mood Makers it was called and I had a mocha and it was easily the best I have ever had. €1.85 – bargain! 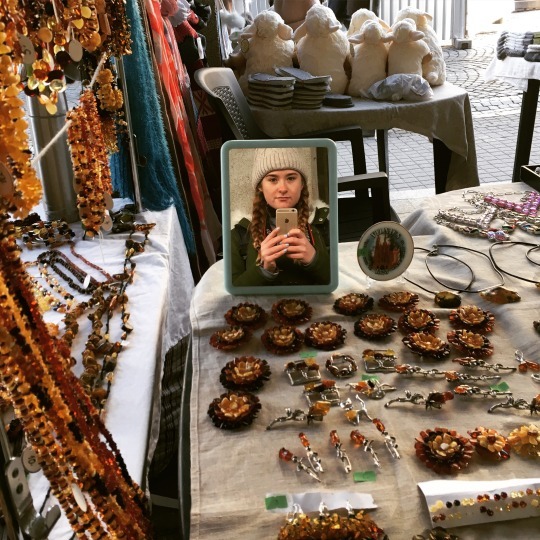 Heading to the famous Old Town next – we had a look around some small market stalls and bought a few really cheap souvenirs! 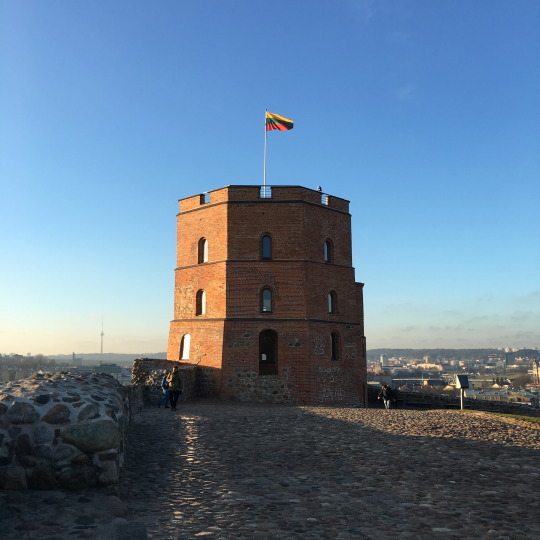 One of the main things to see in Vilnius is Gediminas Tower. Situated on top of a hill in the city center, the view from here is spectacular. Gediminas Tower is the remains from the original castle that was destroyed in the war and is now a museum. 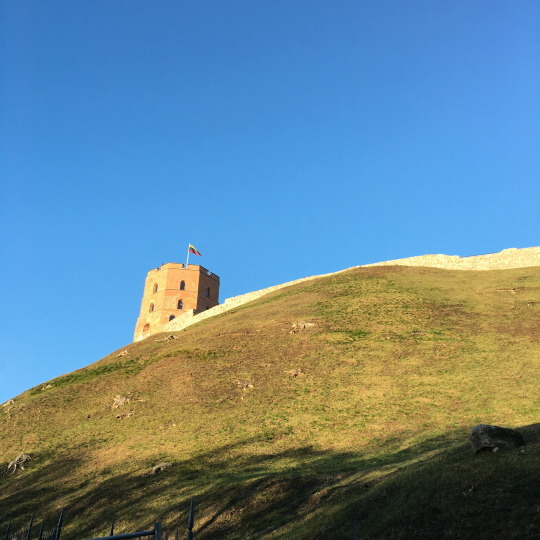 As well as enjoying the view from the hill – you can also climb the tower and take in much more! Palace of the Grand Dukes of Lithuania which sits behind the Cathedral. 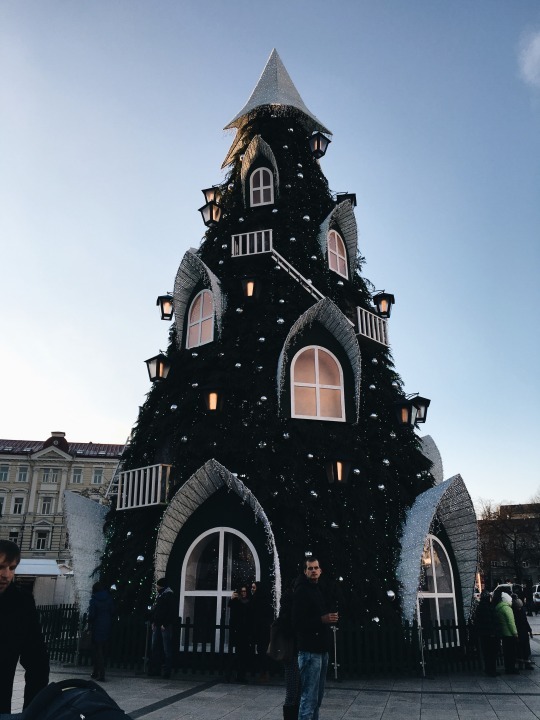 In the middle of the square was the most impressive Christmas Tree I have ever seen at any other Christmas Market. Gediminas Avenue is one of the main streets in Vilnius and can be found next to Cathedral Square. So heading up this is where I found some food. It is difficult finding vegetarian food in this part of Europe especially when wanting something quick! 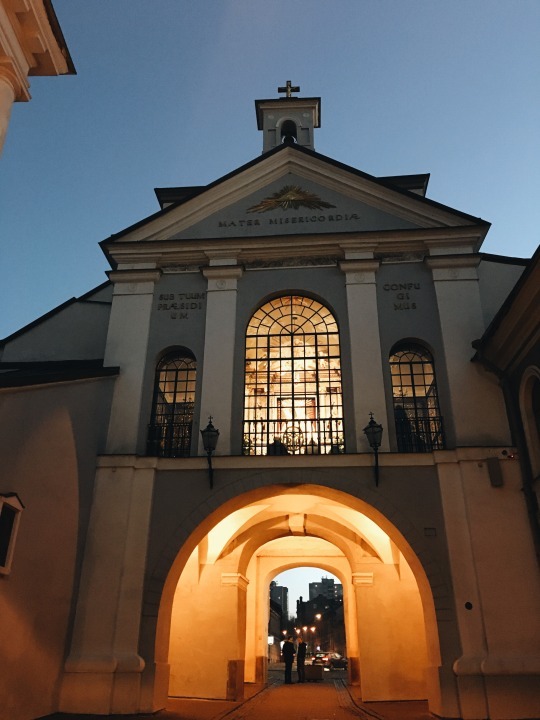 So I picked up a vegetarian pasty from a food truck and a quick portion of fries from Mcdonalds before heading back out re-energized to see more of Vilnius before the sun set. Heading back through the square and following it round passing St Anne’s Church and Cathedral of the Theotokos. Both really impressive pieces of architecture especially The Cathedral of Theotokos which reflects the unique Orthodox Church style of bold colours, tall towers and domes. Last but not least, on route back to the bus station is the Gate of Dawn. 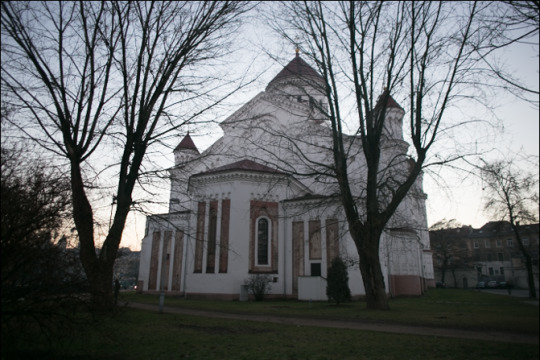 A historical landmark situated on Aušros Vartų and is an important religious artifact. It is the only surviving gate of the first original five gates in the city wall that was built between 1503 and 1522. The painting of the Blessed Virgin Mary, Mother of Mercy, in the Chapel of the Gates of Dawn is known all over the world. 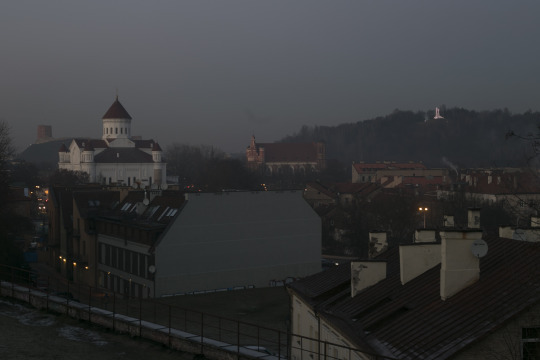 So that was my 6 hours in Vilnius seeing so much! 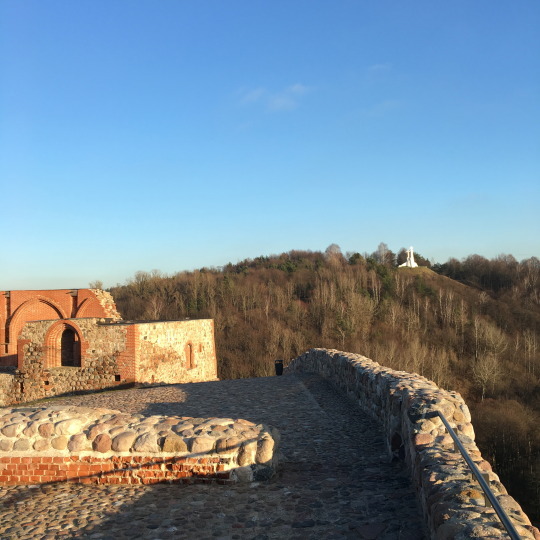 Historical buildings, churches, markets, local food and coffee amazing views and just generally soaking up the Lithuanian Culture!! Looking forward to visiting Estonia to see how this matches up to it’s Baltic neighbours! !